Akira Kurosawa was a filmmaker with an eye toward humanism. It may have been on an epic scale in most films — Seven Samurai and Ran being the chief examples — but it was for the most part grounded in human interaction. He leaned on realism not as a crutch but as an extension of a matter-of-fact worldview that included strong, dignified opinions about justice, morality, and how and to whom to assign blame for any number of indiscretions. With few exceptions — Throne of Blood‘s retelling of William Shakespeare’s Macbeth would be difficult to do without using a form of that play’s paranormal elements — Kurosawa rarely delved into the realm of the abstract. For most of 1980’s Kagemusha, that remains true, but for one resplendent sequence, he tosses aside the realism and embraces dream logic and imagery to masterful effect. The character Kagemusha (Tatsuya Nakadai) is a “shadow warrior,” a common man who bears a twin-like resemblance to warlord Shingen Takeda (also played by Nakadai). For that reason, Shingen’s underlings choose Kagemusha to serve as a double to the lord. After being mortally wounded in battle, Shingen instructs his men that their enemies should not know of his demise for three years — the time it will take for his grandson to come of age and assume his designated seat on the throne — and Kagemusha must pass for Shingen in that time. This is a role Kagemusha does not want. A criminal sentenced to death for a petty theft, he is saved by his lookalike “talent,” but that places him under control of Lord Shingen’s men. He has no choice in the matter; he will be the stand-in or be crucified. It is with these stresses that Kurosawa painstakingly creates a nightmare for Kagemusha to endure. Sleeping fitfully in his chambers, the camera inches toward Kagemusha. While beautifully shot, the film to this point gives no indication this will be more than a moment hinting at his reservations about his role. We expect a quick moment showing the trials Kagemusha must endure; his inability to sleep well would be something shown from an outsider’s perspective and easily glossed over in a lesser work. But a cut to inside Kagemusha’s head brings the audience an experience vastly different from the rest of this film and most films in general. A large painted jar sits atop what appear to be miniature mountains in an impressionist landscape. Is this Kagemusha’s fraudulent kingdom? Japan as a whole? Kurosawa is not interested in the answers to these questions; rather, he concerns himself, and the scene, with guilt filtered through dream logic. Intense lighting highlights already bright reds, blues, and yellows. It’s a harsh beauty; fascinating but ultimately uninviting. The jar moves. It jostles and breaks. From it emerges a fully-armored samurai; it is Shingen. Kagemusha, dressed in rags, stares in terror as Shingen approaches him with menace and hatred in his eyes. As the dead man draws closer, his replacement runs in terror. Why does Shingen chase Kagemusha? After all, the lord was pleased to have such a capable double. Surely he cannot be upset, even after having his identity assumed by a less qualified man. Logically, this makes sense. To stressed, in-over-his-head Kagemusha, though, Shingen’s spirit must hate him. He has spent months, years even, being told, despite their obvious similarities, how different he is from the fallen leader. He and his keepers have had to think on their feet to explain Kagemusha’s different voice — he was “wounded in battle” — and he’s had to steer clear of Shingen’s stable of mistresses so as to not reveal his lack of distinct battle scars. Shingen’s own young grandson can see through the ruse without being able to articulate it. “He’s not scary anymore,” the boy says to the nervous laughter of the men in on the deception. The boy’s remark indicates much of the guilt plaguing the Kagemusha of the dream. Shingen’s belief in the small person led him to choose the boy as his successor, rather than Shingen’s own son. With the lord now dead and Kagemusha installed as dignitary, he needs to uphold the image of his role: a wise leader and loving grandfather. Ironically, he’s better at the latter than Shingen himself; it’s the only thing he does better than the original man. The boy grows a genuine affection for Kagemusha, who returns it in kind. This developing love gnaws at Kagemusha. He’s lying to a person — an impressionable, innocent one at that — about his identity, and how can he convince himself their interactions are anything other than lies? Furthermore, he’s living Shingen’s life; not the one he had as leader, but rather the one he appeared to cherish, that of caring for his grandson. To Kagemusha’s mind, Shingen must be jealous of him, which leads Shingen’s furious spirit to chase him relentlessly in the dream world. The dream convinces Kagemusha, and the audience, of the plan’s inevitable failure. He may look like Shingen, but he cannot replace the man. He and Shingen’s men cannot possibly think of every minute detail that shaped the former leader’s personality, his essence, his individuality. Due to this, Kagemusha’s battle tactics consist of believing questionable parables about Shingen’s ethos; to paraphrase, he was an immovable mountain on the battlefield, willing to wait for the enemy’s mistake rather than attack. Kagemusha may get lucky with that and other decisions, but he lacks the mind for the position; he’s bound to be exposed in time. Uninterested in those responsibilities, he’d rather play with his “grandson.” For all his effort, he cannot be Shingen. He may be a kinder, more compassionate, more approachable person, but he’s not an exceptional person. The boy may love him, but that is not enough, because it’s a misplaced love. In that, he’s failed at his task in the most basic way. Kagemusha is convinced Shingen’s spirit hates him for this failure. His guilt over that inadequacy follows him in his everyday relationships. He’s not what everyone else desperately needs him to be, and therefore not what he wants to be. In that way, Kurosawa’s humanism shines. In both his waking and dreaming lives, the chase doesn’t end. Kagemusha will remain on the run from his own infallibility. If you consider yourself a movie buff like I do, you probably make an effort to see the films noted by critics and filmmakers as the best. In the last few years, I’ve made great strides in expanding my horizons in that regard. As of my most recent count, I’ve seen 248 of the 1,001 Movies You Must See Before You Die (albeit the now slightly outdated 2005 edition), and I feel like I’m relatively educated on the subject of cinema. That is, of course, until I saw the British Film Institute released their once-a-decade Top 50 Greatest Films of All Time list yesterday. Looking at the top 10, I felt I’d done pretty well. I’ve seen Vertigo, Citizen Kane, La Regle du jeu (The Rules of the Game), 2001: A Space Odyssey, and 8 1/2. Quibbles about the worth of La Regle aside (Maybe I’m a dumb American for not appreciating it, but I think Robert Altman did a far more interesting version of the rich-people-and-their-servants-stuck-together-in-a-big-house story with Gosford Park — “BLASPHEMY!” I can hear you all yelling at me), I felt pretty good about myself. Then I read choices 11 through 50. In total, I’ve seen a meager 16 films on the list, and haven’t even heard of a large portion of the entries. Once again, I’m humbled, and for the umpteenth time in my life, I feel this is appropriate. And now, I’m left wondering what my own top 10 would be. I’m too indecisive to rank them by worth, so it will have to be of the “in no particular order” variety. This is something that could change by the hour, and some of these don’t necessarily reflect my feelings on the “best” cinema has to offer; rather, they are the ones I most enjoy and can watch multiple times. Entertainment value plays a huge role. So, here is my list of favorite movies (Thank you, Josh, for the formatting idea). 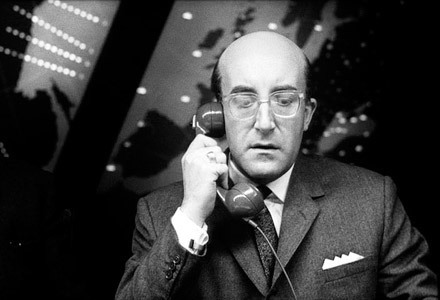 Dr. Strangelove or: How I Learned to Stop Worrying and Love the Bomb – dir. Stanley Kubrick. I could really go with 2001, The Killing, Paths of Glory, or The Shining here, but this one is the funniest, so it makes the cut today. Ghostbusters – dir. Ivan Reitman. It’s both sentimental — when I was a toddler, it served as my babysitter while my mom took care of my little sister — and still really funny. Raiders of the Lost Ark – dir. Steven Spielberg. This week, it edges Close Encounters of the Third Kind. Ask me again next week and it’ll probably be the opposite. Ran – dir. Akira Kurosawa. This is the newest addition, as I only saw it a week and a half ago; see what I mean by the evolving nature of this list? Goodfellas – dir. Martin Scorsese. Like Kubrick and Spielberg, this could be any number of Scorsese’s films, particularly Taxi Driver and Raging Bull. 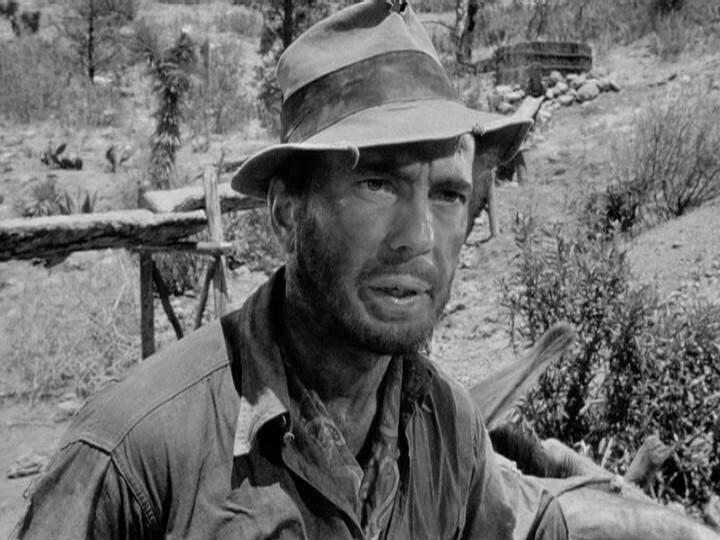 The Treasure of the Sierra Madre – dir. John Huston. Bogart goes unhinged and gets desperate while Huston explores the depths of human greed without neglecting entertainment. 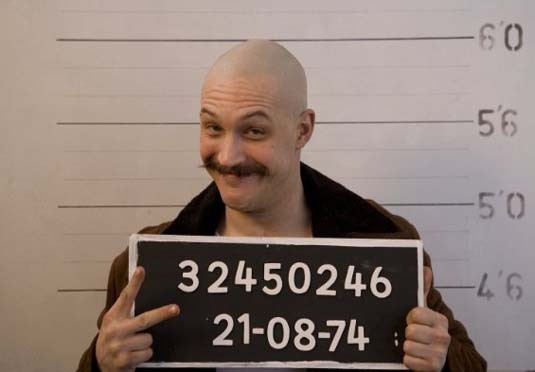 Bronson – dir. Nicolas Winding Refn. This is my generation’s (improvement on (here come the “BLASPHEMY!” charges again)) A Clockwork Orange and features Tom Hardy’s portrayal of an earthquake of a character. Perhaps the finest film of the last five years. 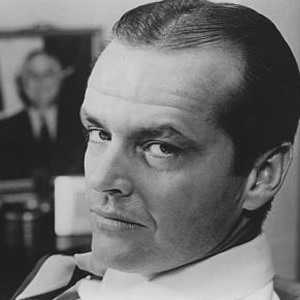 Chinatown – dir. Roman Polanski. A movie without fault. Its story, characters, and themes create one of the greatest stories ever put to celluloid. Fargo – dir. Joel and Ethan Coen. In this, the Coens show a rare affinity for a character — Marge — and play with noir conventions in an Elmore Leonard way. I watch it every six months or so, which is what helps place it above Miller’s Crossing and Barton Fink on my list.